MISSION ESL COMPUTER LAB: "Hang Gliding" from Edcon Publishing. "Hang Gliding" from Edcon Publishing. Leonardo da Vinci: a great Italian artist and experimental scientist. Icarus: a man in Greek legends. For this flyer, an ancient dream has come true. Harnessed to a sail of metal and fabric, a human bird pushes off the side of a cliff. As the sail fills, we watch from the ground with a feeling of anxious excitement - part fear, part admiration, part pure wonder. We are watching one of man's oldest dreams come true. The wish to fly was probably born the moment the first human saw the first bird. Ancient myths of many countries tell of men riding the skies on the backs of huge winged creatures or strange contraptions. Perhaps. 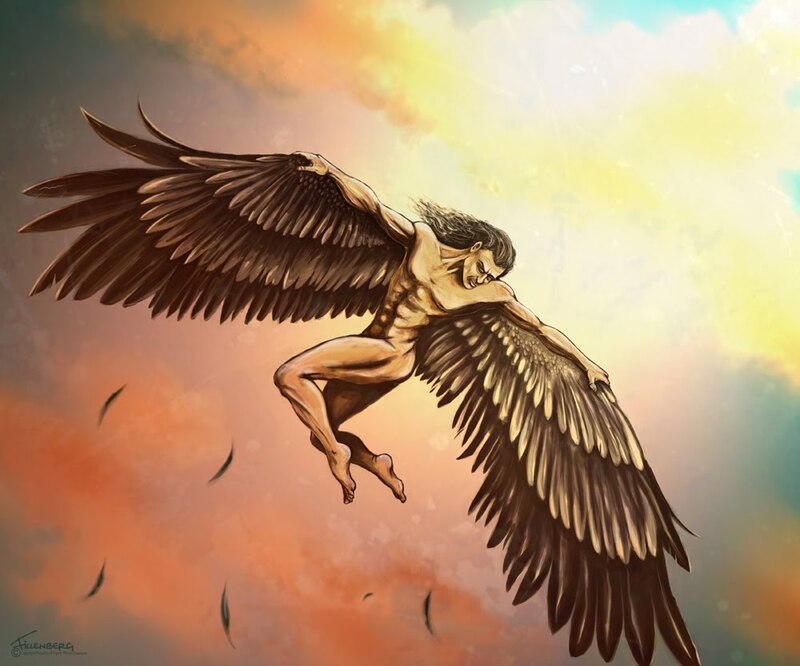 the story most familiar to us is that of Icarus, who flew on wings made of feathers and wax. So great was the sensation of power and freedom,that Icarus was tempted to fly higher and higher. In the end, he flew too near the sun, and the heat melted the wax of his wings. One by one the feathers dropped, and Icarus fell into the sea. For centuries, the idea of flying remained a subject for myths and dreams. Among others, the famous Leonardo da Vinci was excited by the idea. About 1500, he designed a pair of wings large enough to carry a man. That experiment was given up when a servant, testing the wings, jumped from a roof and broke his leg. The age of the airplane began on December 17, 1903, when the Wright Brothers made their first flight at Kitty Hawk, North Carolina. Since then, planes have grown so big and comfortable that the thrill of flying is almost lost. Perhaps that explains the growing appeal of an aerial sport one might have thought had begun and ended with Leonardo's servant. Hang gliding, one of the fastest growing sports in the United States, takes us back to the early dream of birdlike flight. One advanced type of glider is called "Icarus." 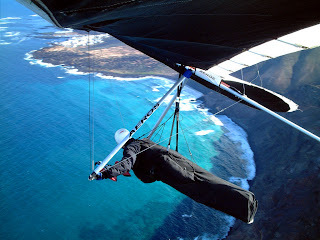 Other types actually resemble the W right brothers' plane, but most hang gliders are much simpler than that. Many of those flying from the dunes near Kitty Hawk today look very much like big, brightcolored kites. In fact, when Francis M. Rogallo first perfected his design for a wing, he could sell it only as a toy kite. Not for ten years, until the early 1960s, were man-sized models of Rogallo's wing to be used for the new sport of gliding. In 1969, an Australian named Bill Bennett performed daring exhibitions in the United States. Bennett's feats stirred great interest, but he and others were towed by small planes. The sport we now call hang gliding, in which the pilot uses his own muscle power to propel himself into the air, began only in 1971. 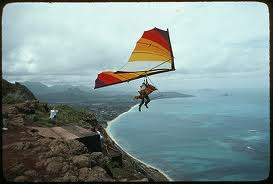 Injust five years there were over 16,000 members in the United States Hang Gliding Association. By far the most common type of glider is the Rogallo wing. Though many companies manufacture it in bold, bright colors, few modify its standard design. A large triangle of aluminum tubing covered with sturdy fabric, it weighs about thirty-five pounds. Under the wing, held by six strong wires, is a small triangle called the "trapeze." The pilot hangs from the wing in a harness. He pushes the trapeze forward or back to change the angle and speed of the wing. In the past, many people had tried to design wings, but failed. The secret of the Rogallo wing is its shape. Moving air above the wing pushes down, while the air underneath pushes up. A rounded hump on top of the wing creates a longer path for the air moving over it. This causes the above-wing pressure to drop slightly. The greater pressure under the wing can then lift it into the air. Are you ready for your first aerial adventure? You have already spent hours at ground school learning about your glider, how to handle it, and what to expect. Now you and your instructor climb a low dune, carrying your folded wing. The dune is ideal for your initial attempt because no rocks, trees, fences, or power lines can get in your way, and the sand will make a soft landing place in case you don't complete a perfect flight. A light, steady breeze is blowing at about ten miles per hour. Flight conditions couldn't be better. "We're not going all the way to the top," your instructor reminds you. "A short hop is all we're after the first time." You double-check every piece of equipment and spend a long time setting up your gear. Finally you get into the harness and snap it carefully to the frame. Lifting the wing until you feel a slight pull on the harness, you bend forward a little, leaning into the 'wind. You check the wind line, the direction of the wind, knowing how important it is to propel yourself straight into it. Your helmet is on, harness tense, wings level, path clear. 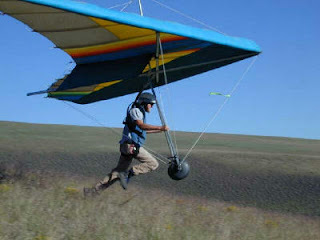 Raising the nose of your glider a bit, you begin to run, remembering to move smoothly, leaning forward. Air fills your wing, and suddenly you are flying. Skimming along a foot above the ground, you have done it - you've conquered the skies! You pull the trapeze a fraction of an inch toward you, letting the nose of the glider drop so it will pick up speed. You've been flying for fifteen seconds, and you're almost to the bottom of the dune. Hoping to make a perfect stand-Up landing, you push the trapeze, tilting the wing back so it will catch more air and go into a stall. The timing is a little tricky here, and somehow you find yourself bouncing along the sand on the seat of your pants. No wonder they call this type of landing a "tail burner." But you can't wait to try again. You're eager for the longer, higher flights you know you'll be making soon, and you're eager to prove you can land on your feet. Though a short, low flight may cause a few bumps and bruises, you don't expect to be hurt badly. Yet there are injuries and deaths from hang gliding accidents. Is hang gliding a dangerous sport? Is the hang glider pilot, like Icarus, always tempted to fly a little longer, a little higher than is really safe? 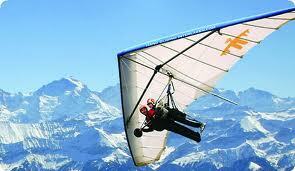 The United States Hang Gliding Association is an organization which sets safety standards for the sport. Flight schools are listed, and the' USHGA urges that all beginners be trained. Hang gliding sites and pilots are rated on a scale from one to six. A site rated Hang Three, for instance, should be attempted only by pilots with a rating of three or higher. An instructor must have a rating of six. The organization tells pilots not to build their own wings or modify those they buy. Many accidents are caused by poor equipment, often because gliders are home made or not assembled with care. The other main cause of accidents is poor judgment. If the wind is too strong, if the trapeze is pushed too far or not far enough, if the site is not safe, if the pilot tries a silly stunt, accidents may happen. Each time a pilot glides off hanging from a bright Rogallo wing, there is some risk. But with good equipment and good judgment, the modern Icarus can fly as birds do and land on his own two feet. a. the wish to design wings. b. the wish to ride on the backs of birds. c. the wish to fly. d. the wish to outdo the Wright brothers. a. large enough to carry a man. b. too small for any man. c. to help birds fly higher. d. to help birds fly faster. large enough to carry a man. a. became popular early in the 1900s. b. became popular in the 1970s. c. may become popular in ten years. d. has been popular since Icarus. became popular in the 1970s. a. Hang Gliding Before 1970.
b. Hang Gliding After 1970.
c. Hang Gliding without Towing. d. the Wright brothers' flight. a. bend forward, leaning into the wind. b. set up your gear. c. snap the harness to the frame. d. raise the nose of the glider. a. become popular with retired people. b. become popular in areas with high mountains. c. provide jobs for people. d. result in lost business for the airlines. a. "Your Own Wings Do the Flying." b. "Saving on Airplane Fares." c. "The Most Dangerous Sport in the World." d. "A Lesson in Safety." "Your Own Wings Do the Flying". b. the invention of the Rogallo wing. c. the history of flight. d. the fast-growing sport of hang gliding. 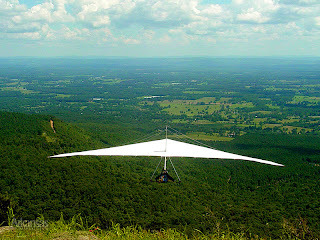 the sport of hang gliding.